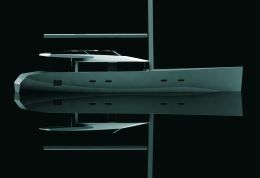 NAUTICALweb - Yacht Design: evolution or revolution? Evolution or revolution: it's hard to establish the pace of the changes over the last decade in yacht design, changes originating both outside and inside our world of boats. External pressures came from Shipping Registers and from customers. Many of the latter now tend to use their yachts in different ways, while authorities like the MCA have issued very strict rules, chiefly concerning safety and in particular fire prevention and control. Internal pressures arose from the genuine desire to always be in the front line, both with regard to yacht design and available building technologies: both areas are still in constant evolution and this obliges Dixon Yacht Design too, which I head, to fully commit itself to compete as a top quality group, among the most advanced, in the multifaceted world of yacht design. First off, let's look at design: what have been the most considerable changes? Size above all. Our design office is involved with large sailing and motor yachts: the 40 metre Antares, a sloop just launched by Royal Huisman, is our biggest for the moment. Ten years ago the production of motor yachts over 100 feet was a rare thing, whereas today our office is employed in this sector to a considerable extent with designs for a great number of shipyards: the Centaurion series, from 30 to 36 metres, the Johnson 103 and the Royal Denship 105 for which the design is under way. This expansion of the market and the consequent growing demand are making the production of such vessels "normal", also from an economical viewpoint. The presence of a notable number of yachts on the market has made the latter far more competitive. As a design factory we have always worked with great commitment in order to make our knowledge base as avant-garde as possible, but today we almost have to get into predicting the future as regards the style and features that will be sought by customers, and these forecasts have to be made with a broad safety margin! Because investments for the production of yachts on a vast scale are enormous and the yards that build them must be sure that they have a good product in their hands that will stay on the market for a fairly long time in order to cover investments and draw the profits necessary for ensuring a subsequent generation of projects. Understanding market mechanisms and supervising development of a product that will be sold not only as a one-off is highly important, also in relation to the different markets where it will be sold. For example the Johnson 87 we designed recently is available in two versions that are considerably different with regard to both the interiors and the flying bridge. This means it can cater to the different life styles and satisfy the different requirements of customers who live in the United States, Europe or in any other part of the world. What our customers want from us is an outstanding feature of the boat that easily identifies the brand. Once again, the Johnsons are a singular example of this, as summarised in the new range of motor yachts built by the US yard, a range strikingly characterised by stylistic elements that make it unique. Another very important aspect which should not be neglected in the production and construction of custom yachts - over and above what our design inputs may be - lies in precise understanding of the production process. The last ten years have seen large investments in technology by shipyards that aimed to remain competitive. To keep abreast, we too have had to increase our know-how in such a way as to be able to supply our customers with increasingly detailed designs capable of fitting in and interacting with their production process. A production step which is becoming increasingly important concerns precisely the creation, in both the design and construction phases, of full scale 3D models. This allows us to give the yards very detailed shipbuilding instructions while they, on their part, are totally involved in the creative process through use of a user-friendly graphic interface. 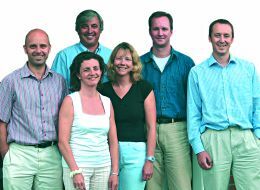 Over the past ten years I have also come to consider it increasingly necessary to have an ever greater number of specialists in my team who, with homogeneous and synergic work processes, can design a vessel from start to finish. This is because when yacht and equipment become complex in their creation there are few aspects of the boat which, if modified, do not involve interventions on other parts by personnel specialised in the various sectors such as engineering, interior design or marine architecture. So today we can no longer just design vessels: we must also understand exhaustively how the yacht is going to be built so that we can define it with a successful design. Another determining factor to consider is the quest for increasingly higher speeds. Over the years this has involved continual evolution of the hull and, more generally, of the whole yacht. Vessels are becoming more complex due to increasingly comprehensive equipment and, with the constantly rising demand, the cabins and everything else must ensure greater comfort aboard. Weight therefore remains one of the most important factors to consider. We're fighting a constant battle for the reduction of weights and the increase of performances. In the last ten years we have been helped by the development of new, light materials and new building methods, while engines, though supplying greater power, have evolved into more compact and lighter units. At the same time we proceed with developing our trademark, meaning our planing hull which, in relation to length, has a wider beam than normal. Intense work of research and verification on our hulls has in fact led to a reduction to the minimum of resistance to progress in the water. This is demonstrated by the prize winning design of the Royal Denship 82' Open which, thanks to the adoption of surface propellers, reaches a speed of over 45 knots. What changes have we noted in our customers and their requirements? I think I'd be right in saying that they cover a broad range of ages, with an increasingly large number of wealthy young men and women who aspire to a superyacht lifestyle. These young customers bring a breath of new challenges because, unlike previous generations, they have different design tastes and are more attentive to current fashions. Many of them work fulltime at high responsibility jobs or run companies that take up a great part of their day, so their leisure time is all the more precious. Requests linked to their free time are currently highly varied, and we believe that they use their yachts more assiduously but for shorter, more intense periods. The yacht has become a private entertainment centre on the water and, consequently, carries an increasingly wider range of equipment connected with activities at sea: jet-skis, water-skiing and SCUBA gear and much else. The numerous hi-fi audiovisual systems installed on board yachts have been further extended by those owners who want a cinema quality film reproduction system. And almost all owners also want latest generation satellite communications aboard. We also note a growing request for increasingly high performance sailboat designs. In a decade our sailboat hulls have really changed a lot, and this evolution is going to continue: ever longer waterline lengths, sail area/displacement ratios that would be more appropriate to a racer, appendages made more complicated by more frequent use of knife-blade and bulb keels to keep up the stability levels required for a cruising boat. Above all, today's big sailboat owners - perhaps much more than in the past - want to be able to handle their yachts on their own rather than leave it to a crew. They therefore demand sophisticated equipment suited to this purpose. Sailing yachts of the "raised saloon" type have gained great popularity and, in our view, this will continue to grow. And since we are among the leaders in designing "deck saloon" yachts, we shall continue to develop this kind of product. There is another area in which we, as designers, succeed in creating that individuality sought by our customers and which may be clearly seen in the differences perceptible between "Antares" and "That's It", two of our most recent designs. Our latest launching - "Antares" - belongs to an owner who asked us to make as homogeneous as possible the entire area of the yacht running from saloon to stern, rendering the cockpits an integral part of a single space. At the Royal Huisman yard, where they know something about shipbuilding, they made the following comment while the yacht was still being built: "Walking around aboard "Antares" in her present state of completion, you begin to appreciate the influence that Bill Dixon has brought to the drawing board. Her singular superstructure, which took shape in accordance with complex multidirectional curves and has a finely audacious look, gives a sensation of absolute security to someone standing in the stern cockpit. The configuration of the steering cockpit, developed in communication with the one for guests, assures the helmsman visual contact with everything that happens on the bridge and above it." More than ten years ago a yacht with a particularly cared-for style was more or less confined to history, since few were built and even fewer designed. Now it seems that we've returned to the past! On our desks at the moment there's a vessel which challenges its designer's ingenuity and which, like many of our designs, reflects the owner's lifestyle. 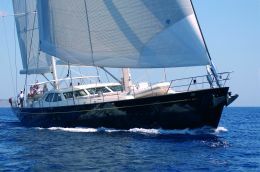 It's a boat that can move between both yachting sectors - sail and motor - and can only be described as a 25 metre motor- sailer, equipped with an engine capable of giving her 13 knots and with a powerful but manageable sloop rig for good performances also under sail. The interiors are more like those of a motoryacht and, surprisingly for a vessel of this size, there is also a flying bridge. What are the alterations in motoryachts? I've already outlined the changes that have come about in planing vessels which, as demanded by the main markets, are exclusively of the flying bridge and open types. Yet there are a growing number of customers who appreciate the comfort of displacement motoryachts and their ability to make long range cruises. 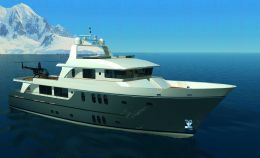 Two of our recent designs - which aroused considerable interest - are the 27 metre Royalship and its 33 metre big sister. Their design, surprisingly compact for a three deck vessel, attracts the owner who seeks a comfortable yacht that can be handled by a small crew. Today we can at last say that the superyacht business has really become global. Our customers come from practically everywhere and we build their yachts in increasingly different places. So, evolution or revolution? It's a good question, and my reply is that the demand for changes will tend to augment rather than diminish. This will make our job more fun, will throw down new challenges to our experience, ingenuity and creativity. And this will lead to an increase in our ability to be always capable of satisfying our future customers' requirements.